Did you know that the Okanagan has the greatest biodiversity in Canada? It is an excellent place for people to connect with nature! The Okanagan Heritage Museum is hosting Birds of Prey, a bilingual travelling exhibition from the Royal BC Museum, from May 1 to August 5, 2019. Throughout time, people have feared and admired birds of prey, but what do we really know about them? Find out in Birds of Prey, which includes mounted specimens of all 16 species of owl and all 19 species of vulture, hawk, eagle and falcon native to Canada. Snowy Owls, Turkey Vultures, Ospreys and Peregrine Falcons are just a few of the featured species. 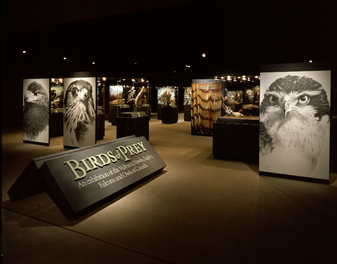 With specimens displayed in natural poses and surrounded by elements suggestive of their habitats, Birds of Prey illustrates their might and majesty in a lifelike setting. The exhibition gives visitors the rare opportunity to see these incredible creatures eye to steely eye. Visitors will also have a chance to learn the nsyilxcən names for some of the species. 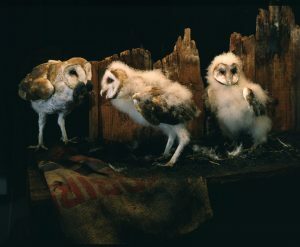 The Common Barn Owl breeds at any time of year when food is abundant? The Northern Harrier can hear its prey moving in the long grass? The Ferruginous Hawk adds to the same nest year after year, sometimes resulting in immense structures? The elusive Great Gray Owl is sometimes called the “phantom of the northern forest”? The Red-shouldered Hawk prefers to sit and wait for its prey to show itself rather than actively hunt? Some owls, such as the Northern Hawk Owl, the Boreal Owl and the Western Screech Owl, will nest in holes left by woodpeckers? For the first four or five years of their lives Bald Eagles do not have white heads? Please join us for the Opening Celebration on May 4, 2:00pm-4:00pm. Enter a draw to win a prize! We have two special Exhibit Tours at 2:30pm & 3:30pm.